As hinted on Saturday I'm currently working on a page about A Morning in Port Charlotte for my Scotland Summer 2006 travelogue. This is also an excellent opportunity for my loose series linking to old pictures from Islay and Jura. 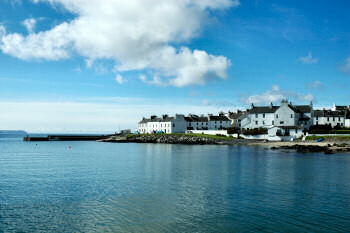 Many consider Port Charlotte to be the prettiest village on Islay, I'm certainly among them. Part of the appeal is probably that it hasn't changed too much over the years. I'm not sure what exactly the term means, but I believe Port Charlotte has the status of a ‘conservation village’. It's not exactly the same angle, but take a look at this picture of Port Charlotte, Rinns of Islay on Am Baile from 1902 and compare it to the picture above, taken in August 2006. Looks strikingly similar, doesn't it?